Developing a system to measure PR's effectiveness may sound impossible, but a new set of principles is swiftly making measurement a reality. The International Association for Measurement and Communications (AMEC) and other industry organizations, such as the Institute for Public Relations (IPR) and the Public Relations Society of America (PRSA), are making steady progress toward a PR measurement standard. Some 200 practitioners, corporate executives, vendors, and representatives from 30 countries attended AMEC's early-June meeting in Lisbon, its third annual global summit on measurement standards. “To make public relations more effective, the bottom line is to raise measurement standards to a higher level,” said Don Wright, Harold Burson professor and chair in public relations at Boston University's College of Communication. “PR measurement has been scattered. And [some PR professionals] have focused on the lowest of the methodological measures,” added Wright, who is also on the board of trustees of IPR and past chairman of its commission on public relations measurement and evaluation. 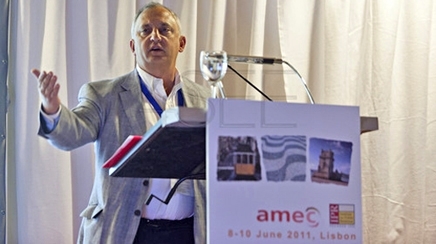 AMEC's so-called Lisbon Summit followed up on last year's gathering in Barcelona, and participants debated the seven principles adopted in 2010. The most-supported issues coming out of Lisbon were: 1) measuring PR's return on investment (ROI); 2) creating and adopting global standards for social media measurement; 3) making measurement of PR campaigns and programs part of the PR toolkit; and 4) instituting a client-education program, so that customers insist on measurement of outputs, outcomes, and business results. Industry organizations want to limit the use of Advertising Value Equivalency (AVE) in measuring a campaign's value to a client. An ad and a news story about a product are on equal footing with the AVE measurement, Wright explained. But it measures nothing, he contends. The other fallacy, according to proponents of the new standards, relies on favoring output rather than outcome. The output is how many media impressions were made through a PR effort, while the outcome is how consumers actually acted — how many read the article, bought the car, went to the movie, or took up the cause. “The world's greatest love letter is useless if you it don't achieve the desired effect — get the date or marry the person,” Wright added. Revamping measurement standards has been discussed for some 20 years. The debate intensified about a decade ago, followed a year later by the IPR's first conference dedicated to measurement standards. Each industry gathering, including the one in Lisbon and the upcoming 9th North American Summit on Public Relations Measurement, sponsored by the IPR and PRSA, advances the move toward effective measurements, supporters say. In addition, some companies have built businesses around enumerating media placements and using AVEs and, as such, they are reluctant to start anew with a different type of business model and methodology. “What the industry needs is a ‘measurement spring,' in which the smart, savvy graduate students and new grads revolt against the silly metrics of the past,” said Katie Delahaye Paine, CEO of KDPaine & Partners, LLC, a New Hampshire-based company. The firm has been measuring a wide range of elements for 24 years, both in and out of the PR industry."